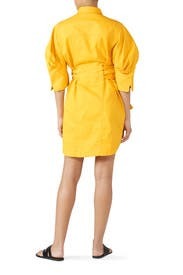 Exaggerated sleeves and an oversized tie play with proportion on this color-pop Acler shirtdress. Yellow denim (100% Cotton). Hourglass. Three quarter sleeves. Shirt collar neckline. Exposed front button down closure. Pockets. 35.5" from shoulder to hemline. Imported. This dress is the Lebron of RTR. Truly the greatest of all time. The day before I wore this I had a brutal day at work and was deep in regret mode of recently hooking up with an ex. Truly low. 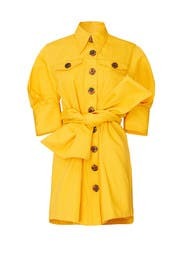 I woke up and decided to wear this and, hand to god, all my troubles melted away. I was untouchable. A force. Life was going to exactly how I wanted and nothing could stop me. This dress is magic. Your skin will glow. Your day four hair will shine. You will have total randos commenting on its cuteness on Instagram. You aren't ready. But order it!!! It runs big, I'm normally a 8, sometimes 6, and the 6 is roomy. It still looks amazing. Its perfect and I don't see a future where I am sending it back any time soon.